It’s that time of year again. The days are getting shorter and the temperatures are getting colder. The leaves are changing color and dropping from the trees to prepare for the frigid winter months. This isn’t my first rodeo with winter but I did step out of the ring for 7 years to live in the sunny, warm Caribbean. It was there that a simple sprained ankle didn’t heal and CRPS spread from one foot to both feet. After flying back to the states for a diagnosis I was told to move back for medical treatment or lose the ability to walk. In February of 2015 I moved back to be closer to family & my medical team and was inevitably greeted by frigid temperatures and snow in Virginia. It was one of the most difficult transitions I have ever made. Things that never bothered me now could land me in bed for a full day. I use to love snow and was an avid snowboarder, however CRPS put an end to these days of sliding down mountains, as I could not longer withstand the cold or the pressure on my feet. As the temperatures drop you can feel it in your bones. If I could describe the way that CRPS feels in a limb when it’s cold, I would have to say that it feels like someone could grab my foot and snap it in half just like an icicle. The cold can get so deep in your bones that the pain can be unmanageable. Your CRPS will be different temperature than the rest of your body. For instance, today it is rainy outside and while from the knees up I am sweating, unable to regulate temperature in my body my feet are ice cold to touch. 1. Improve Circulation: One of the reasons that affected limbs are degrees colder is because of circulation issues. Try a light massage on your area of CRPS and if this is too painful (some people are able to withstand and some people are not) then try a light massage on the closest area affected that you can stand. For instance, if you only have CRPS in your feet, try massaging your calf to get blood flowing, if it is in your hands, have someone massage your arms or your back to help stimulate blood flow. 2. Heating Pads: Heating pads can be a person’s best friend in cold weather. Keep one or two by your favorite place to sit and by your side of the bed. You can also find heating pads that plug in to the car. Remember to be careful with all heating pads. Our affected limbs are sensitive and you don’t want to start a flare or burn yourself. Start out with a low heat and slowly work up. 3.Space Heaters: This is the best invention since sliced bread. Space heaters allow me to heat under my desk at work (while having a cooling fan plugged into my computer with a USB- I know my body is temperature nightmare!). I also use space heaters to sit by me in the living room as supplemental heat. Everyone else in your home can live comfortably while you are just a tad warmer. 4.Toe or Hand Warmers: Another genius invention. I buy these in bulk from Amazon after literally being left out in the cold, after they sold out in every store in my small hometown. (They are a favorite with farmers!) These have adhesive backs that you peel and stick to the bottom of your sock and it keeps your feet warm for hours. Even if you don’t have CRPS in your feet, you can help your body stay warm with this simple and inexpensive accessory. 5. Warm bath with Epsom salt: Whenever I get chilled to the bone or can’t thaw my ice cold feet, I run a warm bath and throw in some Epsom salt, which helps with aches and pains as well. Being in warm water helps your body warm up quicker & for me the steam of warm water is therapeutic, helping me breathe better. Hot showers would work in the same way, however I typically can’t take showers because the falling water fills like daggers being thrown in my feet. 7.Fuzzy warm socks/gloves: You all know the ones I am talking about. The ones that you may find as stocking stuffers at Christmas. They are warm and fuzzy and not too irritating for CRPS feet/hands (in fact they are the ONLY socks I wore last year!). They are comfortable and keep you warm. WalMart has an entire wall of fuzzy, silky texture socks & they are affordable. 8.Soft, fluffy light warm blankets. My bed is texture heaven. I’ve always loved soft sheets, comfy comforters and lots of pillows but since getting CRPS, I HAVE TO HAVE things around me that don’t irritate my body. While my CRPS is primarily in my feet and mouth, during a flare, my entire body is sensitive to all fabric (I can’t even wear jeans anymore!) The best blankets I have found are at TJ MAXX, Marshalls and Home Goods. You can walk through the bedding isle and feel everything to determine what is the perfect throw for you. This sounds silly to the outsider, but those with CRPS KNOW comfort is a daily struggle. These blankets also go with me when I travel or am admitted to the hospital. 9.Physical Therapy- Physical Therapy is always of critical importance with CRPS. It helps with protecting us against future injuries due to loss of strength and mobility. One of the most important things we have learned is we need to move (please find this balance with your physical therapist, as everyone is different). Daily movement will help improve circulation and get the blood flowing the areas that need it most. One of my personal favorite physical therapy activities in the winter is getting into the heated therapy pool. Aqua therapy can be easier on your joints & pain levels. The warm water is also therapeutic for your tired body. 10.Don’t Isolate Yourself: As the colder months roll in, many of us decrease our already scarce social outings. Winter can be a contributor to high pain but it can also be the perfect storm for depression. Try to make a point to get out and be around friends for lunch, going to the movies or if battling the cold is too much, have your friends come over & order delivery. Friendships & laughter are crucial to getting through difficult times & help us all in the fight against that the depression component of this disease. Remember, everyone is different. What works for me may not work for someone else. Be sensitive to those that live with the disease. While we all may have different methods to survive the winter, we are all in this together. If you have something that helps you, please feel free to share it with us & leave a comment. Thank you for sharing your story. I have had CRPS for 2 years now. Have you seen thecrpshopefoundation.com? I have found that site to be incredibly inspiring and helpful. I hope you have seen some improvements. You are not alone and thank you for letting your readers know they are not alone. Thanks for sharing, after a foot injury I was diagnosed with CRPS. Most days I can not put a sock on don’t even try a shoe. The pain is real. My next step will be a trial of a DRG nerve stimulator hopefully this will help the pain level. Thank you so very much for sharing yur story with us. I’ve had CRPS for two years now after I broke my Talus bone. I was told I needed an ankle fusion. The operation was 4 1/2 hours, and I developed CRPS shortly after. I am now disabled, after doctor said that 70% of my pain would decrease. That I would be able to go back to work, and have my life back. Unfortunately, that was not the case. I am now disabled. I have CRPS on both legs now. The pain & swelling is horrible. I want my life back. It’s good to know that I am not alone. 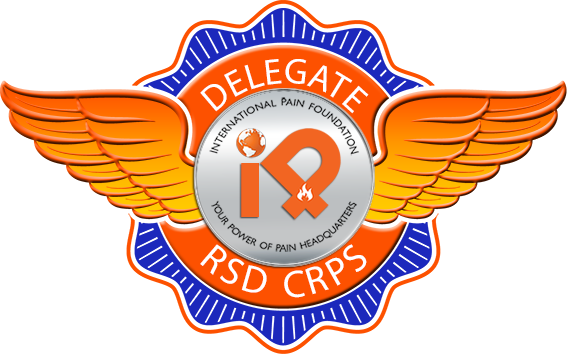 So many individuals DO NOT KNOW what CRPS. Even medical doctors are not familiarized with this disease. They need to be educated. So many need to be educated. I can go on… But I won’t. 🙂 Hugs to everyone here. Hoping one they can find a cure to this nightmare. Blessings, love & light to you all.